There is no better way to say “I love you” on Mother’s Day than to solve this week’s ScuttleButton puzzle. picture of a kid wearing a “Vote for Mom” tee-shirt — I always remember this button to be for a local candidate in Florida, but that’s all I remember. UPDATE: John Clark of Tallahassee knew this button immediately. It was used for Sally Munroe, an unsuccessful candidate for the Florida state house of representatives in the 1970s. Thanks, John! 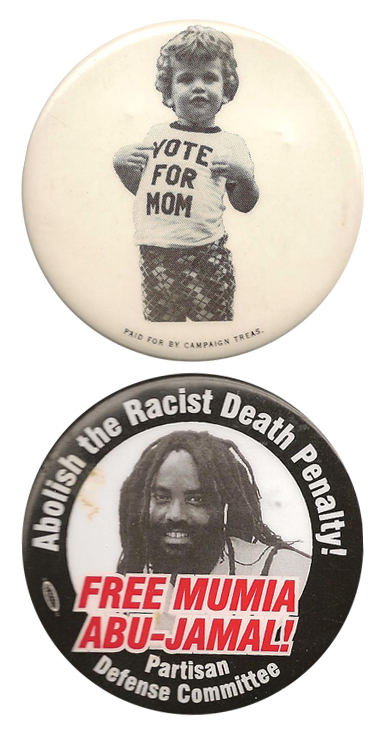 Abolish the Racist Death Penalty/Free Mumia Abu-Jamal! — He was convicted of killing a Philadelphia police officer in 1981; his trial and imprisonment have been part of a longstanding ideological battle over the death penalty and the criminal justice system. Momma Mia. This is either the worst movie in history (seriously, I had to sit there and listen to Pierce Brosnan sing), or a famous line in an old Alka Seltzer TV commercial. Clearly, I prefer the latter. Regardless, this week’s randomly selected winner is … Luke Fuszard of Middleton, Wis. Luke gets the coveted Political Junkie button.